Stop Physician Burnout - is Physician Resilience Training a "Con"
Stop Physician Burnout - is Physician Resilience Training a "Con Job?" The "con" of building physician resilience has left junior doctors vulnerable to mental illness and suicide by ignoring the systemic failures of the medical profession. Speaking at a session on mental health and wellbeing in Sydney alongside Health Minister Brad Hazzard, Ms Micaela Abbott said her sister was "eaten alive" by the medical profession. Dr. Chloe Abbott was 29 and a fourth-year doctor-in-training when she died in January, one of several recent suicides by doctors that prompted the Health Minister and the medical profession to act. "My family had really detested the term 'resilience'," Ms Abbott said, recounting her sister's fortitude as a champion swimmer who represented Australia in international competition. "That's not something you can do without resilience," she told the crowd of students about to join the profession that Dr Abbott's family and colleagues believed contributed to her death. " It, of course, begs the question -- is the concept of Physician Resilience a con job to defend a hostile work environment? 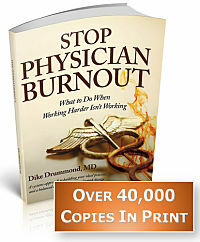 Resilience is necessary but insufficient to prevent physician burnout and hard wire the Quadruple Aim into the workplace. We have talked about the concept of physician resilience before and I have always believed resilience to be a hostile term to the front line care providers -- physicians and all staff. 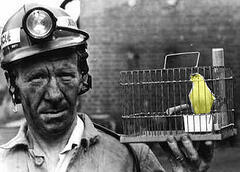 To understand why, you must grasp the significance of the Canary and the Coal Mine. Physicians and staff are the canary in the coal mine of healthcare. We are the indicator of the health of the systems of care. There are two fundamental components of this metaphor. The Canary strategy for burnout prevention is personal resilience. Simply completing the gladiator-style survival contest that is a proper medical education is a massive test of resilience. If you conduct a formal resilience training initiative -- equipping the canaries to tolerate their working conditions more effectively -- they will turn to you and ask the logical question, "What about this mine?" They know that a stronger canary is never enough. The canaries are doing their part. 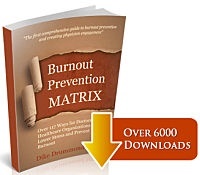 Who is working a parallel burnout prevention strategy for the MINE?? a) More efficient work flow and care systems that eliminate the death by a thousand clicks and InBox whack-a-mole -- currently driving everyone to distraction in a whirlwind of meaningless busy work. b) A more supportive culture that acknowledges the stress of this profession and the humanity of the people in the system - patients, family and providers and staff. The canaries need evidence that you care and that you have their back. The only way to work the mine strategy is through collaboration. The workers in the system must be allowed to give feedback and have their input honored by the designers of the mine. The mine designers must ask for and honor that feedback. The most hostile workplaces are where that spirit of collaboration breaks down as it appears to have done in portions of the healthcare system in Australia, the British NHS and a number of healthcare organizations across the USA. "It's absolutely devastating that this conversation was only generated after the loss of my sister, but we need to get these important changes in place," Ms Abbott said. "Chloe's death can't be a waste." Dr Chloe Abbott died in January, one of several recent junior doctors to commit suicide. Convening the panel, psychiatrist and National Mental Health Commissioner Ian Hickie said the current focus on building resilience ignored the deleterious culture of medicine and dangerous working conditions to which junior doctors were subjected. Professor Ian Hickie said physician resilience was a 'con' that distracted from meaningfully addressing dangerous work conditions for doctors. "It's this con of individual resilience that is part of the problem," Dr Hickie said. "We operate on a collegiate system that has been unregulated but has demonstrably failed to move into the 21st century." He drew parallels with the aviation industry that had industrial safeguards in place so that pilots did not fly while fatigued. "Why should doctors treating patients be any different?" he asked. Mr. Hazzard flagged overhauling legislation that required doctors to report colleagues who had a health condition that put patients at risk, over concerns the law was stopping doctors with mental illness seeking help. Currently, all registered health practitioners must report a doctor to the medical regulator if they believe the doctor is "placing the public at risk of substantial harm" due to a health issue, including mental health. But junior doctors believed any mental health problem could be reported, Mr Hazzard said. That is the question isn't it. Can we work together to build resilient, capable, caring providers AND a better mine ... at the same time? Only then will conditions gradually improve and tragic cases like Dr. Chloe Abbott perhaps be avoided in the future. Where does this collaboration take place in YOUR system? 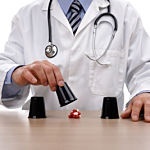 In national health services, like Australia, you must often involve government agencies -- where change can be as difficult as turning a supertanker. Here in the USA, the locus of collaboration is often the committees that govern your hospital or the organization that is your employer. Are they asking for your input to design the better mine? 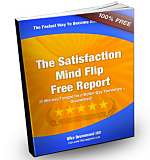 Are you providing feedback and how is it being perceived? What is the character of collaboration in your organization? Where do you see it working and where is it much in need of improvement?